Attention people who like the sound of a whip cracking! Hold the phone tightly in your hand and crack it like a whip to hear the sound of well... a whip cracking! Or simply tap the 'whip' on the screen. 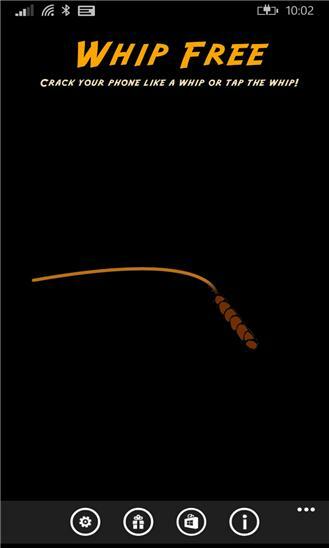 You will even see a animated whip in this latest version. Not a fan of the ads? You can now remove the ads with an in-app purchase! Feel free to leave feedback or send an email thru the app. Twitter: @goodbar_dev Email: goodbardevelopment@outlook.com Like us on Facebook: https://www.facebook.com/pages/Whip-Free/210449355723064 [release notes v3.0 - 11/21/2014] - (WP81) Added whip-o-gram in-app purchases! - Added in-app purchases that let you make a donation of your choice to remove the ad banner. - Added check for MAGNETOMETER (aka compass), without this you cannot use the whip motion but you can still tap the whip to crack it. - Added ratings prompt after multiple uses. Users can opt out of future requests. [release notes v2.3.1 - 10/27/2014] - Fixed issue causing sound distortion at the end of the whip crack on WP8.1 [release notes v2.3 - submitted 8/10/2014] - removed Location capability per user feedback. - removed app analytics package. [release notes v2.2 - submitted 7/23/2014] - added transparent tile - updated about page [release notes v2.1 - submitted 10/14/2013] - added animated whip - added about page - added ability to share the app on social networks. - improved UI. [release notes v2.0 - submitted 9/22/2013] - added animated whip - added about page - added ability to share the app on social networks. - improved UI. 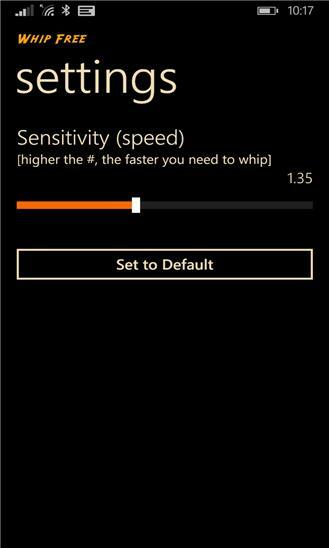 [release notes v1.7 - submitted 4/3/2013] - Added new paid, ad-free version with button to the newly published app "Whip" in the windows phone store. - Updated goodbar development email address. [release notes v1.6 - submitted 5/26/2012] - Optimizations - Expanded the sensitivity settings to a range of 0.25 - 3.00 [release notes v1.5 - submitted 5/10/2012] - Removed 'save' button from settings screen in favor of the back button. - Added 'rate me' button to main screen. [release notes v1.4 - submitted 3/26/2012] - Added Settings page to adjust sensitivity of motion. - Cleaned up the main page.